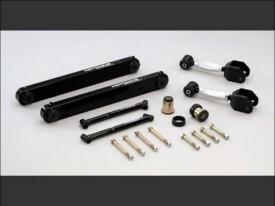 These Adjustable upper and lower trailing arms work together to positively locate and control the rear axle. Launches are quicker, smoother and more consistent by reducing wheel hop. The adjustable upper arms allow for easy pinion angle changes to better tune your vehicle. Cornering and overall stability are dramatically improved through increased roll stiffness and sway bar effectiveness. The fabricated trailing arms are constructed from one piece of .120" wall TIG welded steel tubing and include greasable polyurethane bushings. Trailing arm mount braces and hardware are also included.